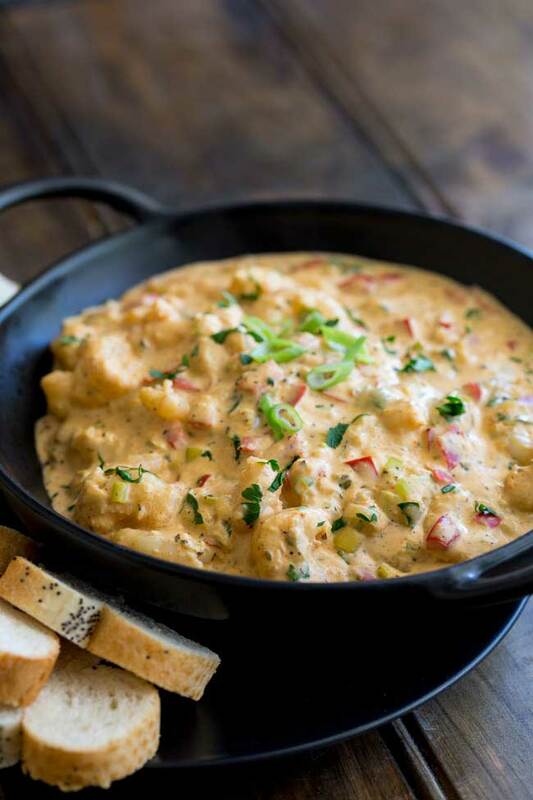 This hot Louisiana Shrimp Dip is delicious and super easy to make. Juicy shrimp are cooked with traditional Creole flavours, cream cheese, sour cream, green onions and bell peppers to make this warm dip. It is the perfect appetizer for parties and is a sure fire crowd pleaser. Serve it at your super bowl gathering or your Mardi gras party. This hot shrimp dip is perfect for any occasion when people are together and they want a delicious creamy snack. The recipe takes about 15 minutes. Can I make Hot Shrimp Dip in advance? I have had success with keeping the shrimp dip refrigerated overnight and then heating it up before a party but the shrimp weren’t quite as succulent. To make this in advance I now cook the dip without the shrimp and keep that refrigerated. Then on the evening when I want to serve, I heat the dip up, fry off the shrimp in a little butter and stir them though the hot dip. To keep the dish warm, I have used the candle warmers designed for keeping food warm at the table, and also suspending the bowl of dip into a slow cooker with a couple of cups of hot water in it. Can I serve this dip cold? You sure can! I would suggest serving it at room temperature as when it is straight from the fridge the cream cheese in it, makes it quite hard. It is more of a spread than a dip. But 30 minutes after you remove it from the fridge it starts to soften. You are going to want to eat a lot of this dip as it is so delicious!!! So the vehicle you choose for getting it into your mouth is important. Or go for more substantial vegetables. These will all need to be blanched in boiling water for 2 minutes and then shocked in ice water. This keeps them bright green (save from the cauliflower) and crisp-tender. Where can I buy Creole Seasoning? A quick search on Walmart website shows a great choice of Creole seasoning blends. Just check the salt content and salt your dip accordingly. But if you have the time, then I make my own Creole seasoning, it is quick to make and keeps for weeks/months in the pantry. Plus you can adapt it to your own tastes. I know I have had a few comments to say my creole seasoning is missing cumin. But for me that takes in a a cajun direction. Similar but not quite the same. All that being said, if you can’t get creole seasoning or are a big lover of cumin and cajun flavors then cajun seasoning works well here too. If you are a shrimp lover then why not check out one of my other favourite shrimp recipes!!!! Steamed Shrimp with Old Bay cocktail sauce. So good!! 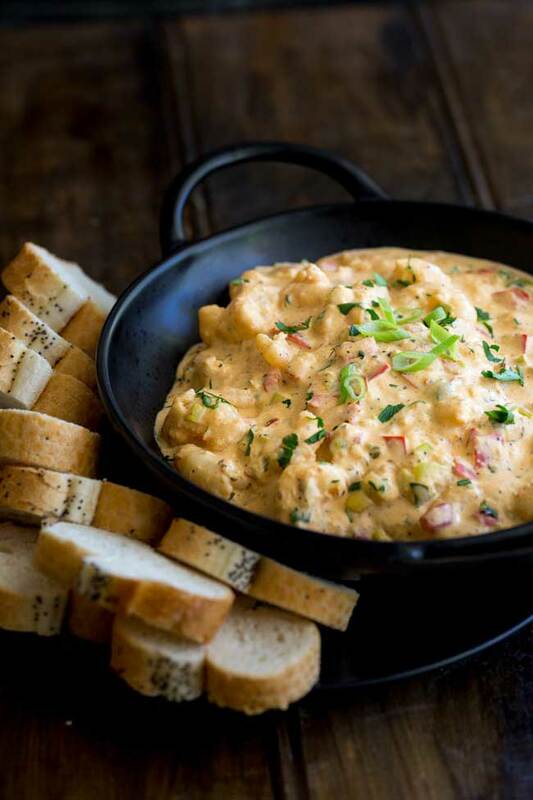 Why not pin this recipe for Hot Louisiana Shrimp Dip. Pin it here. 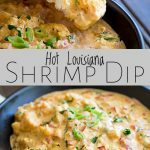 This hot Louisiana Shrimp Dip is delicious and super easy to make. Juicy shrimp are cooked with traditional Creole flavours, cream cheese, sour cream, green onions and bell peppers to make this warm dip. It is the perfect appetizer for parties and is a sure fire crowd pleaser. Serve it at your Christmas party/super bowl gathering/Mardi gras party. 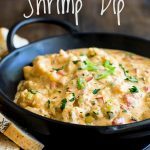 This hot shrimp dip is perfect for any occasion when people are together and they want a delicious creamy snack. Chop the spring onion and red capsicum into small dice/rings. Reserve the green part of the spring onion for later. Add the vegetables to the butter, stir to coat and then cook over a medium heat for 4-5 minutes until softened. Chop the shrimp meat into small chunks. Either in half or thirds if your shrimp are jumbo. Add in the prawns and garlic, stir well and cook for 2 minutes until the prawns have turned pink. Stir in the cream cheese, sour cream and creole seasoning. Bring to a simmer and then cook for 2 minutes until everything is thick and creamy. Stir in the lemon juice and parsley then check the seasoning. Serve garnished with the reserved spring onion greens and a little extra parsley. For this shrimp dip I choose smaller shrimps. Ideally looking at something that comes in at 40/50 count. I use my own Homemade Creole Seasoning blend. You can get the recipe here. Nutritional information excludes any bread/crackers/vegetable batons. 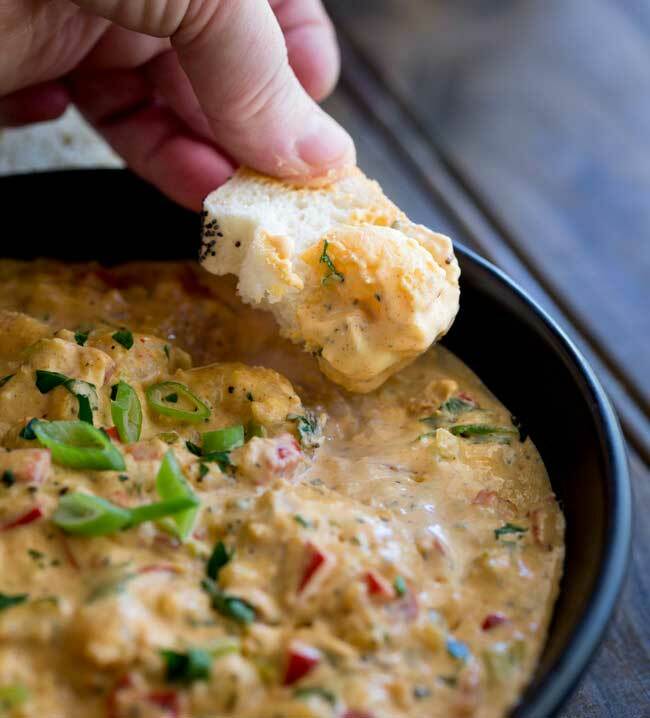 If you love food why not subscribe to my newsletter, I will drop you an email every now and then, just to say hi and send you a couple of recipes I think you might love, like this Hot Louisiana Shrimp Dip. Mardi Gras is this coming Tuesday, which makes sense as it is always on a Tuesday and as such is always followed by a Wednesday….and not any old Wednesday. We are talking Ash Wednesday and the start of Lent. So with it being Mardi Gras tomorrow, in true New Orleans style I am sharing a hot shrimp dip. This baby is super rich and creamy and will serve a crowd, so it is perfect if you are having a Mardi Gras celebration. The perfect dish before you start lent! 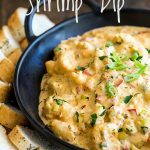 This hot Louisiana Shrimp Dip is definitely my definition of all things yummy!! I mean, just look at it!!! Rich, creamy, packed with chunky pieces of shrimp and perfect for dunking your bread into. Go for some bread with a bit of crunch and your tastebuds will thank you! Mardi Gras always reminds me of the Darius Rucker song “Craziest thing that she’s ever done”. I know it is only mentioned once, but it is the first thing that pops into my head when someone says Mardi Gras!!! 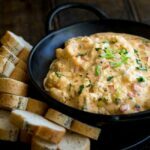 Now I know I have mentioned Mardi Gras a lot, but really I am doing this hot Louisiana shrimp dip a disservice. Perfect for any time you want something, rich, cream and completely yum!!!! This is delicious! I will make it again many times! Thank you for including me in your round up Kristy. Could you use craw fish or aka crawdad meat in place of the shrimp? This was delicious! I wanted to serve it over cooked rice so I added about a third of heavy cream to make sauce. Loved it. Oh Mary that sound like a fabulous dinner! I am definitely going to have to try that one. I am so happy you enjoyed it. This sound delicious!! How would I keep the dip warm? Would it hold up in a crock pot set on the “warm” setting for a party? This looks amazing. Perfect for any celebration or holiday. 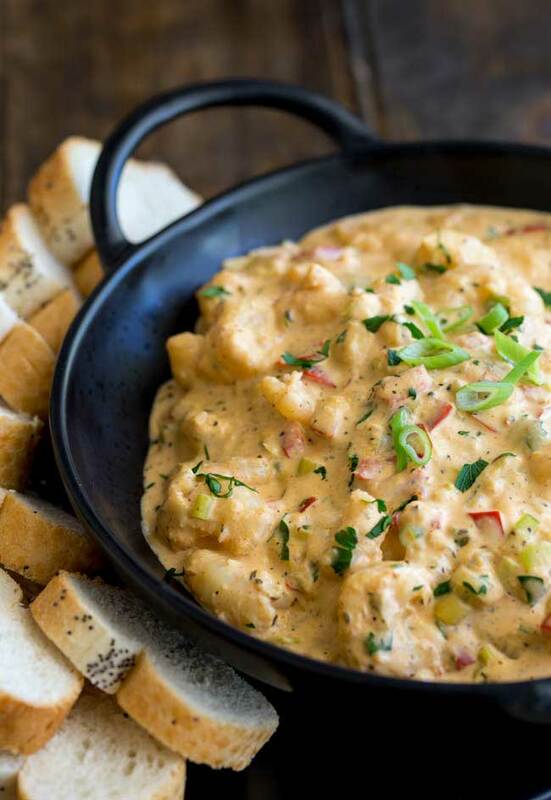 I’m loving all the cheesy seafood goodness that’s in this dip. It’s on the must make list! Can’t wait to try it. 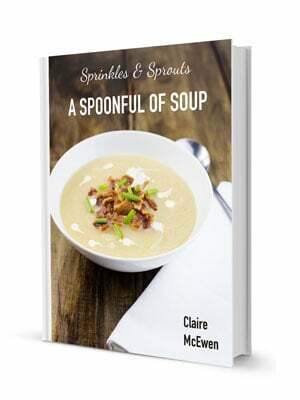 I love the theme of this collection – so many good recipes to check out. Your dip sounds amazing too!